This is a fun one that I plan to continue as a series. They really seem to stand out from the crowd, and many people commented on them. I began by making sure I’d removed absolutely all traces of other nail varnish, before starting with a base coat, as the bare nail is visible for this one. I then used a pale green to coat the tips twice, going a little bit further down the nail than my natural tips. Once dry, I used a white nail pen to add the small dots for the eyes of the frogs, using enough paint to give a strong colour without having to add another coat. 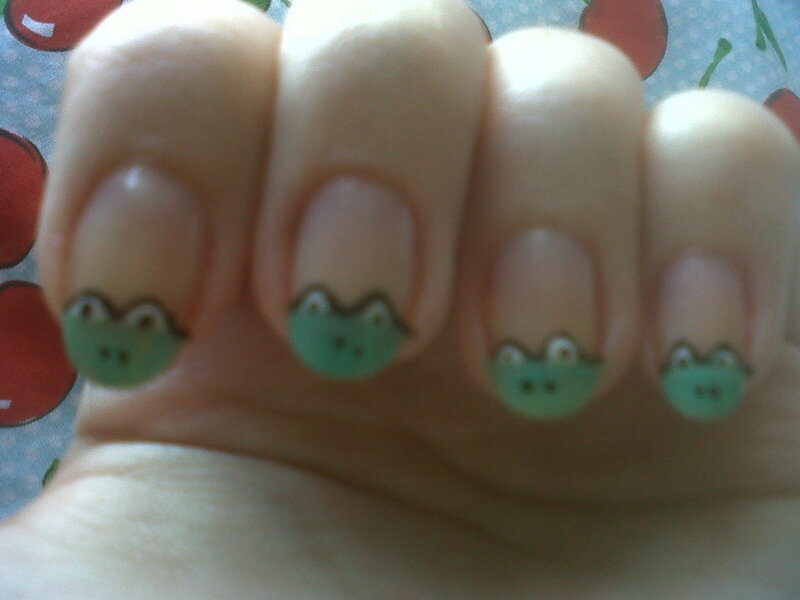 After these had dried, I then used a black nail pen to outline the top edge of each frog, and add in the pupils of the eyes and the nostrils as well. I finished with two coats of clear top coat. This is important with this design, as the detail on the top edge means a raised tip, so chipping will occur quickly if not protected properly. Rather than leaving a bare nail base, it is an option to use a pale blue colour to give a ‘pond’ effect. Personally, I preferred it without as the frogs stand out more. I’m not sure how easy it would be to do this one without pens, as it took me several attempts to get the right style, with it being quite fiddly in its detail. I’m hoping to start this as a series of ‘peeping’ animals – there have been many suggestions, but I’m thinking about ducks and giraffes at the moment. We’ll see, and I’ll post them on here if I do!